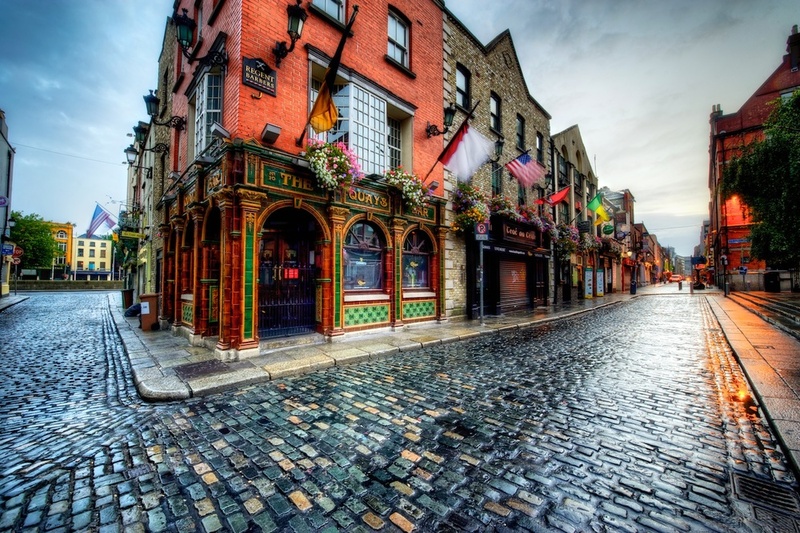 The Quays Bar sits in the Temple Bar district in Dublin, Ireland. I kept pronouncing it as "Kways" but apparently it is pronounced as "Keys". Well, that was news to me but no matter how it is pronounced, it's cool-looking. I got up early one morning to walk around and photograph this area, and since there was a light rain a little earlier that day, it left a nice sheen on the cobblestone streets. That always makes me happy. One of the many benefits of getting up early is finding great scenes like this that are completely empty of tourists. Having walked through this area several times during the early evening hours, I can tell you how crowded it gets....really crowded. So get yourself some caffeine and get up early - there are some cool photo opps waiting for you just after sunrise!